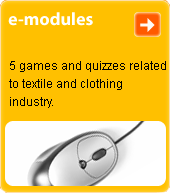 Welcome to the English version of the multimedia textile defining dictionary with over 2000 textile and clothing terms. If you want to find the definition of the concrete term, find it in “index” or enter into search field and click on button “go”. Via button “search” you can display all pages which contain searched term. If required use the help. Via button Random page you can go through the dictionary with random offered terms without any order.